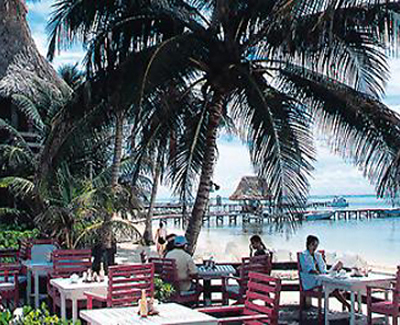 Spanning 1,000 feet of beachfront, this tropical thatch-roofed village is a diver’s paradise . . .
Spanning 1,000 feet of beachfront, this tropical thatch-roofed village is a diver’s paradise. Clustered amid exotic flora and coconut palms, 60 cabanas feature full baths, hand-rubbed floors, tropical accents, and private decks. The village offers a wide range of water sports and amenities, including open water certification, on-site dive shop, equipment rentals, and guided excursions to the underwater canyons of the world’s second largest barrier reef. Enjoy swimming in the freshwater pool, casual dining in Ramon’s open-air restaurant, and relaxing to the tune of steel band music and tropical drinks in "The Purple Parrot."